On Mount Rinjani there is a Lake / Caldera called ‘Segara Anak’. Segara Anak Lake with an altitude of ± 2.010 m above sea level and lake depth of about ± 230 meters has a shape like a crescent moon with an area of about 1,100 Ha. In addition, there are also 2 (two) mountain cones in the eastern caldera, namely Mount ‘Barujari’ or Mount ‘Tenga’, area 2376 m and Mount ‘Mas’ or Mountain ‘Rombongan’, height 2110 m above sea level. 1846; Zollinger said that in 1846 G. Rinjani activity in the fumarola stadium, the next eruption that took place in the Calendar Rinjani (Mount Barujari and Gunung Rombongan / Mas). 1884; In Natuurkunding Tijdschrift voor Nederl. Indie, v. 45, stating that smoke and flames appear in the first few days of August. 1901; June 1, at eleven o’clock came the explosion, and the next night in Mataram there was a thin ash rain. 1906; April, at 21:15 was heard explosion. 1909; November 30, at 21:15 rainy ash in Lombok lasting until December 2nd. After that the activity seemed to increase as thick smoke was steaming. The river water looks cloudy ..
1915; November 4 looks smoke pole. 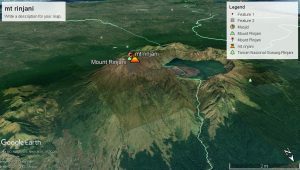 1944; According to Petroeschevsky, 30 May seen smoke above the peak of Mount Rinjani. activities began on December 25, 1943. 1966; March 28 The island of Lombok is shaken by the earthquake. Since then came the sound of boom coming from Segara Anak. May 21 is visible from the summit of Mount Punduk, that to the south of the New Mount crater to get out of the sand from the bottom of Segara Anak to the north and widened to the west and east. 1994; June 4, pkl. 02.00 WITA happened a very powerful explosion coming from inside Caldera Rinjani, heard up in Sembalun Village. At 8:00 am visible thick black smoke soared into the air reaches 400 m high from the top of Mount Plawangan. 2009; On May 2, 2009 at 16.01 WITA smoke eruption occurred in a dark brown color reaching a height of 1000 meters above the point of eruption in MountBarujari accompanied by a weak sound boom. It is unclear when the Rinjani Caldera was formed, but when it saw the vast expanse of sandstone, it indicates that the eruption of Mount Rinjani at that time was so powerful that it formed a very large caldera hole. From the history of the eruption and the material released during the eruption are lava deposits and deposits of pyroclastic fall and pyroclastic flow deposits, it is characterized that the eruptive nature of Mount Rinjani is Strombolian which is carried with lava flows. Volcanic activity of Mount Rinjani after the caldera has moved into the caldera. The main morphology of Mount Rinjani is the morphology of the caldera and the cone of volcano. The caldera morphology is elliptical, with a slope of 60-80 degrees. The base rocks are lava and pyroclastic fall. The morphology of the volcano cone occupies the inside of the caldera as well as the cliffs of the caldera wall, the cone of Mount Barujari, Mount Rombongan, Rinjani, and the cone of Mount Manuk. The slope of the slope ranges from 30 to 70 degrees, with a radial river flow pattern, while the base rock is a pyroclastic fall. While the morphology of high hills and low-corrugated ridge morphology each located in the east, west and the top of the slopes of the Rinjani complex and the lower slopes of the Rinjani complex. Each of the latter two morphologies is characterized by having a steep cliff with 30-80 slope angles and a slope angle of less than 30 degrees. Based on historical record of eruption, Mount Rinjani has 3 activity period, that is activity before caldera formation (pre caldera), the time of caldera formation and period after caldera formation. The rock produced in the Pre Caldera period is dominated by lava sediment scattered almost in all directions, with the eruption center coming from several locations from old to young namely: Old Rinjani Mountain Product, Kondo Mountain, Gunung Sangkareang and Mount Rinjani. The rocks are scattered from the north-west of the caldera, the southern slopes, to the north and the younger ones are mostly scattered to the southeast, east and northeast. Van Bemmelen (1949) states that the structure of the northern island of Lombok is a continuation of the Solo Zone of Java Island which is the formation of the top of the path of geantiklin. The Solo Zone to the east is exposed on the western part of Lombok Island with its basement covered by plutonic intrusions, and this structure is on the island of Lombok. Blown (1974, in Nasution et al, 1984) interpreted that the structure of the island of Lombok at the end of the Tertiary or early Quaternary there are several fault structures whose direction varies, the faulted faults south-northeast, south-south-north-northeast and north-south possibly active faults moving from Tertiary to Quaternary. Based on regional heavyweight survey results, there is a cesarean structure that trails north-east – south southwest. Meanwhile, based on the interpretation of straightness in the landsat image shows the direction of south south-southwest straightness – north northeast.